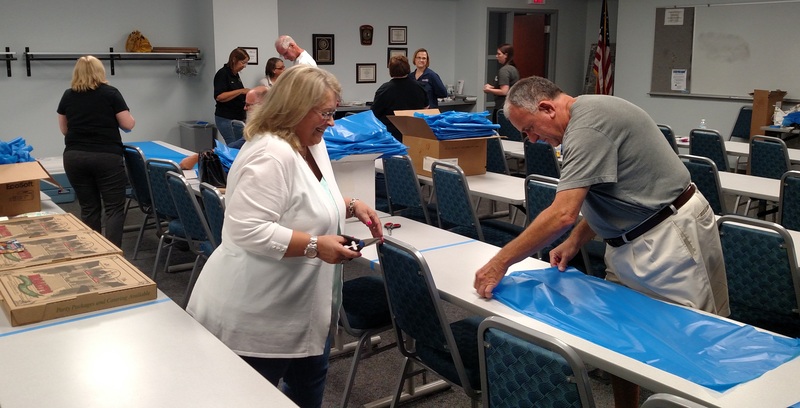 On August 9, 2016, several individuals gathered together to prepare blue plastic tablecloths to be used as ribbons. Residents, the Chief of Police, the Deputy Chief, and members of the Westmont Citizens Police Academy Alumni Association assisted with this project. “It is so great to see the overwhelming support for our Police officers from everyone involved”. said Bruce Barker,Chairman of the Westmont First Committee and Village Trustee. “Our goal is to see blue ribbons and porch lights in all neighborhoods throughout Westmont”. The ribbons are to be used by residents and businesses to place on their parkway trees or mailbox posts for the next month to show support for all those officers that keep us safe everyday in our village. Along with the ribbons there are blue light bulbs for your porch light while supplies last. Both the ribbons and the bulbs were sponsored by local businesses. If you or your business is interested in sponsoring the Westmont Citizens Police Academy Alumni Association & Westmont First project, you can contact the Academy through the village.